Paragliding Vacations in Spain - Main tourist attractions from a birds-eye view! Enjoy some dream paragliding vacations and the wonderful moments between heaven and earth. It will make the world look so small and your thoughts wander off into the distance. Feel happy - just let your soul dangle! 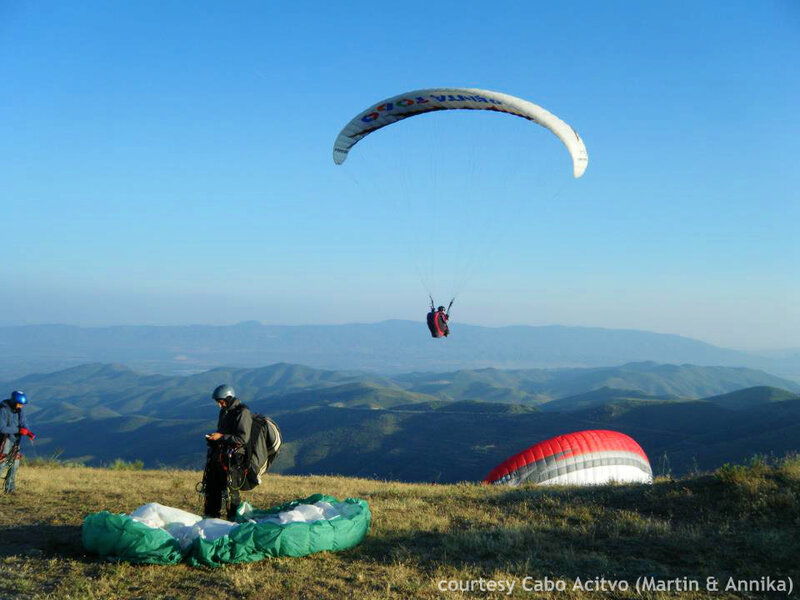 Martin, founder of CaboActivo maintains close contacts with the local association of the paragliders and will be your certified tandem pilot (in case you don't have your own license), creating that heavenly experience you'll never forget! For groups of experienced pilots with their own equipment, he offers guided day trips to the local flying areas. Paragliding with a tandem pilot is a unique experience! - Enjoy the view and the silence. During the flight you can normally talk to each other. If you have thermals, you will be able to feel the ups and downs - the invisible force that moves the wing! 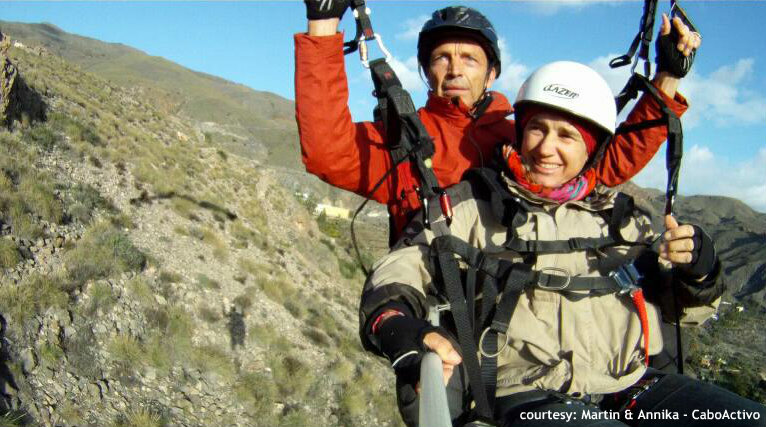 With Martin as your tandem paragliding pilot you will share the beautiful bird-eye view of the flight together. Over the course of a tandem flight, you will get information from Martin - it's much easier than you think! Feel like a bird, while contemplating the ancient volcano, desert and beach landscape from above. A unique experience in this area of Southern Spain. Paragliding is a very young sport. While the "glider" in the 80 `s and 90` was used as a rapid descent for hikers, with mostly bad glides and questionable safety, nowadays the modern wings are enormously powerful and safe. The wing profile is created shortly after raising up against the wind. the air fills the inner chambers of the glider the air in a split second - a back pressure is created that makes the "wings" airworthy as a glider. Paragliding is pure enjoyment and a gentle sport. 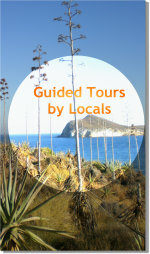 Annika and Martin have been living in Cabo de Gata Natural Park since many years. 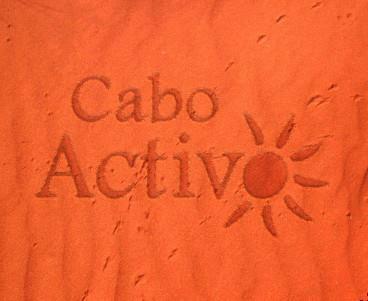 Martin is the founder of Cabo Activo and apart from Paragliding Vacations he also offers cycling tours for their guests. Annika runs a well established Vacational Cottage Cortijo El Campillo, where she receives many sun-seeking tourists from Northern Europe and other parts of the world. We have visited them and I can assure you it is a perfect place to hide and re-charge batteries! It is located right next to Western Movie Locations in Albaricoque and not far from Federico García Lorca's real life setting of "The Blood Wedding" : Cortijo del Fraile. Associated Accommodation: Annika's beautiful Farmhouse Rental "Cortijo el Campillo" !